"The advantage of industrialization is that you get consistency," Shaun Winter stated succinctly on a hot summer afternoon outside of The Fresh Pot in North Portland. With a sentiment like that, we could have been talking about anything, from the cups of coffee in front of each us, to the qualities of the neighborhood we sat in. Beyond its mix of one-of-a-kind stores, this stretch of North Portland contains more than a few Portland-area chains like Laughing Planet, and yes, The Fresh Pot. But we were talking about hot peppers. 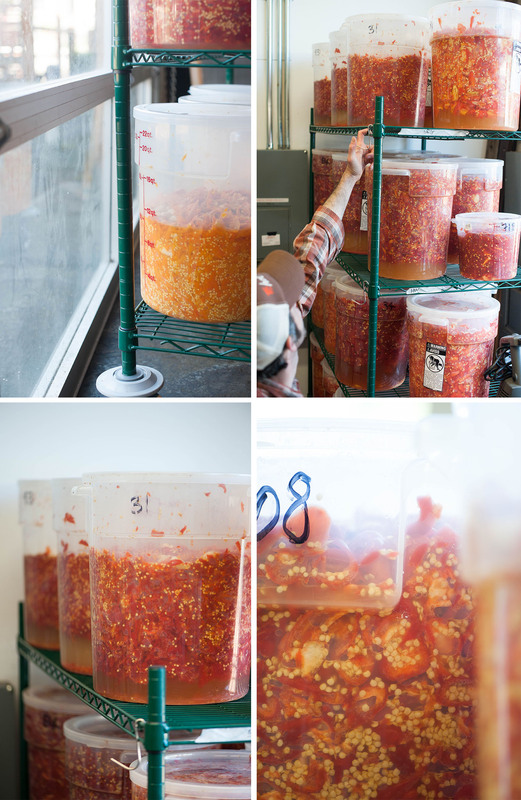 Specifically, the peppers Shaun has selected and fermented into hot sauce that’s sold all over Portland – and increasingly throughout the country – under the “Hot Winter” label. “I’m okay with not having things always be identical as long as they’re consistently delicious,” Shaun continued. 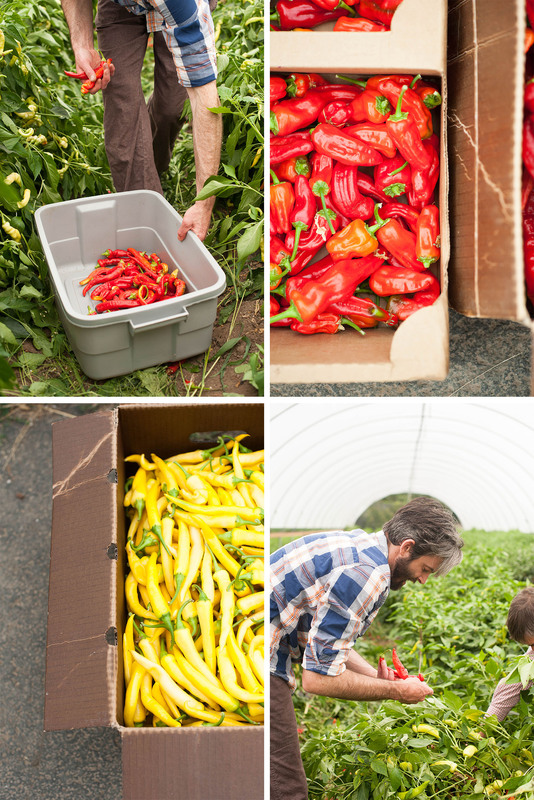 For the past three growing seasons, Shaun has turned thousands of pounds of peppers, including his eponymous pepper, the Hot Winter (its seed selected and saved from a rogue Jimmy Nardello pepper), into different hot sauce concoctions, from mild, to golden hot, to extra extra hot. 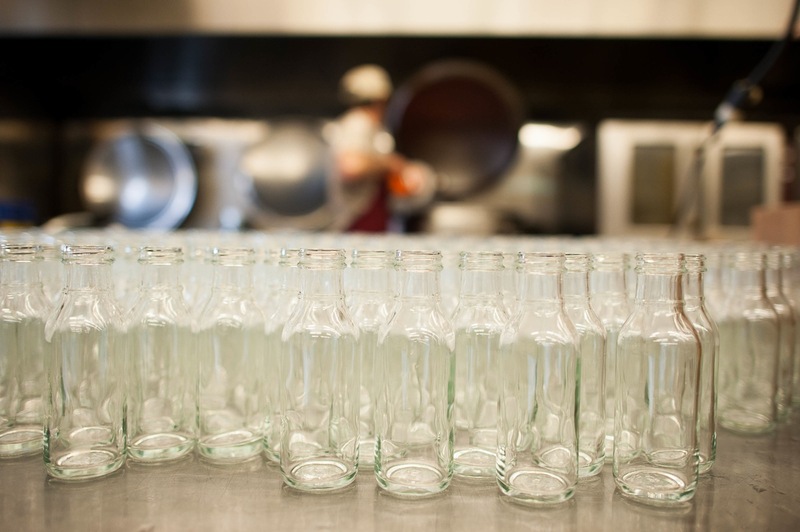 Each bottle’s flavor is roughly the same each year, but batches and vintages are also different enough to be noticeable, the taste changing in unique, just-perceptible ways. 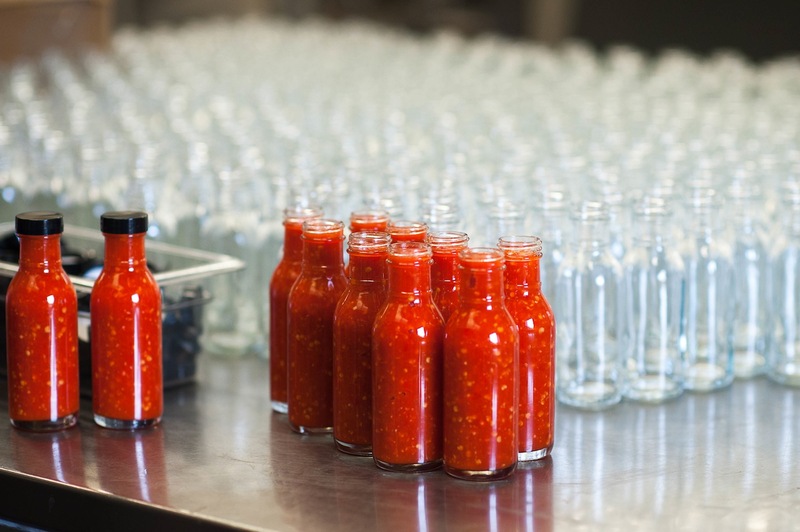 The makers of industrially produced hot sauce seek to create a consistent product no matter if you’re coating your omelette at an all day buffet in Las Vegas or dousing the inside of a burrito purchased from a Manhattan food cart. 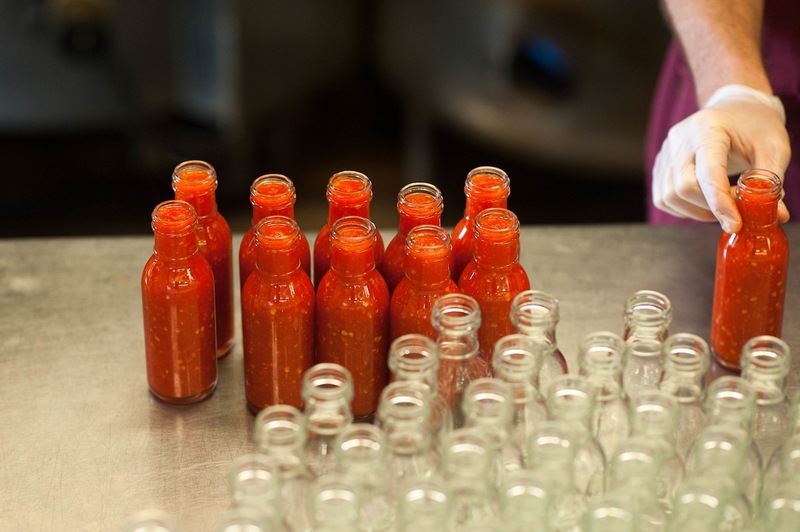 Shaun, however, strives to produce a hot sauce that is memorable within each bottle: an edible time capsule of the year, the pepper varieties, and the farmers who grew the fruiting vegetables. If you bought a bottle of last year’s Hinkelhatz sauce and compared it to a bottle fermented this year, you’d immediately taste similar flavor notes because the composition of peppers (Hungarian Hot Wax, Hinkelhatz, and Shaun’s own Hot Winter) and garlic is the same. But it wouldn’t be “the same” in the way a bottle of Tabasco or Sriracha is. 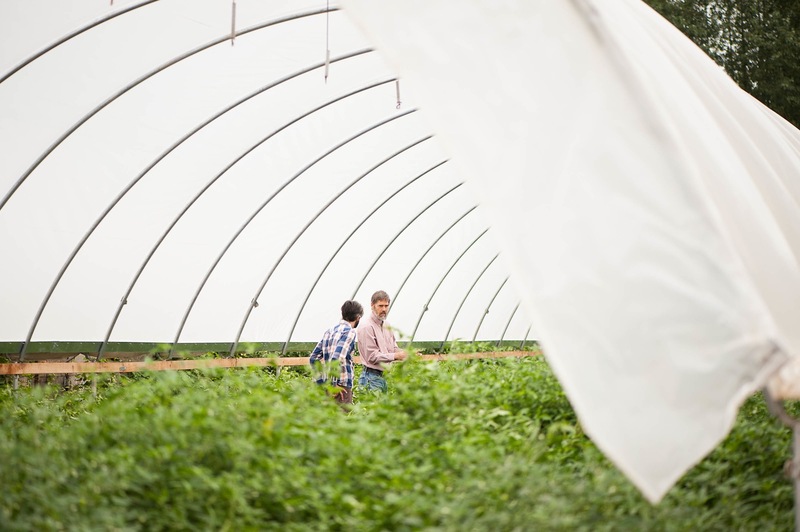 One of the key differences between smaller, community focused farmers and producers and industrially-minded farmers and producers is that the smaller producers have a flexibility to nimbly adapt with changes, seasonal or otherwise. Sriracha has created a predictable product that they can replicate year round, other factors be damned, and you’ll find no argument here about its deliciousness. I know that when I grab a bottle from someone’s fridge or off a restaurant table, I’ll taste that sweet, addictive burn, no matter where I am or even what year it is. This is less true with Hot Winter’s sauce. Yes, it’s consistently delicious, and specific concoctions taste roughly the same bottle to bottle, but the taste of a 2013 vintage and one made this year would not be an exact replica. Shaun wants it this way – that’s the whole point. 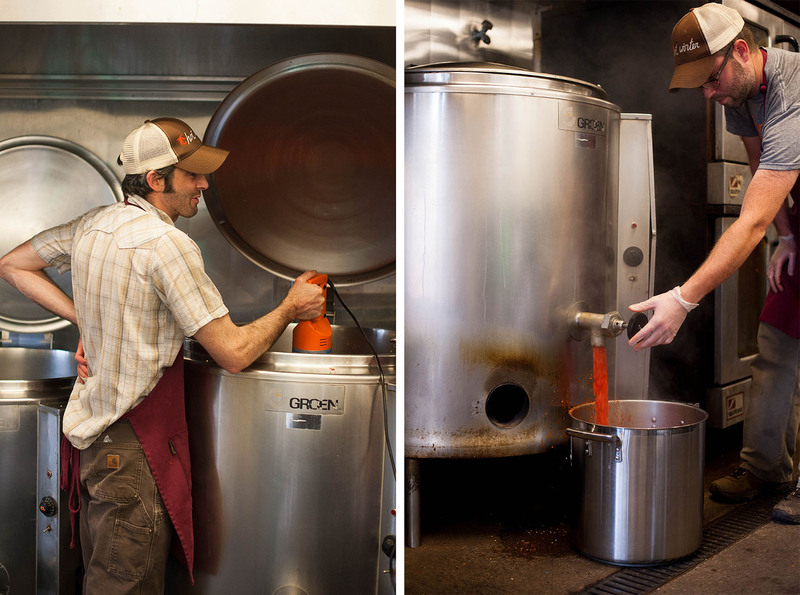 He chases flavor, drawing out the peppers’ inherent qualities through extended fermentation of each pepper variety before mixing and blending the fermented peppers together with curiosity and focus. 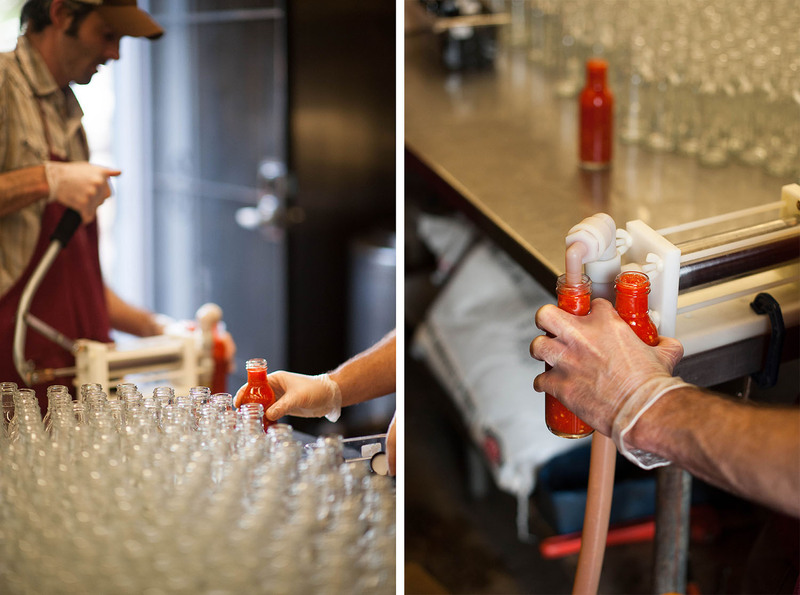 You can taste the nuances of farmer, growing season, and pepper variety in each bottle. 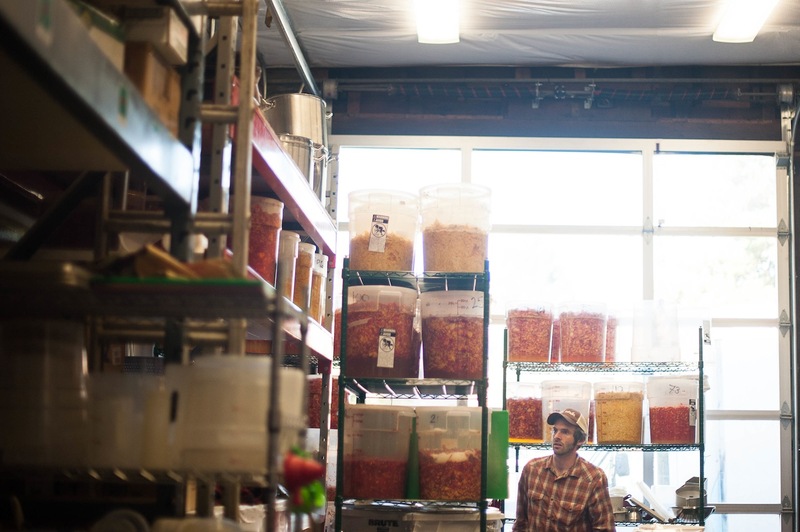 Even before he started making hot sauce for a living, Shaun understood the intimate connection between land, community, and flavor, his knowledge base stoked by a varied life that’s found him working on an influential organic farm in Washington (the first certified organic farm in the state), as a carpenter in the Bay Area, and most recently, before becoming the hot sauce producer he is today, at a farm in Northern California. This farm, Mountain Home, allowed Shaun to explore a previously untapped side of himself, influenced by the farm’s focus on “putting up” and preserving unique flavors, both in the concoctions to be “put up” (jam, hot hot sauce, pickles) and by selecting seeds for flavor and vitality. According to Glenn Roberts of Anson Mills, and documented by Dan Barber, if you’re a farmer or seed saver, “going sportin’” means seeking out a plant in a crop that doesn’t look like the others. This rogue plant’s seeds are then saved and grown out next season, celebrated and cultivated for their distinct traits: an extra juicy, quick growing tomato, a hardy, colorful beanpod, or, for Shaun, a sweet pepper that tastes pleasingly hot: a Jimmy Nardello with an identity crisis. All creatures, plant or human, are a product of a complicated interplay incorporating their environment and the dominant and recessive genes within their physical forms, an interplay that can take generations to yield a particular result. “The Jimmy itself isn’t a chile pepper,” Shaun explained, “it’s a sweet pepper that came with the Nardello family [from Italy] in 18.” A popular market chile that’s “more earthy” than most sweet peppers, its thin walls respond well to drying. Shaun and his coworker Erin (the head farmer at Mountain Home) sold buckets of these at farmers’ markets in California. One season, they received repeated complaints that the Jimmys were hot – really hot. 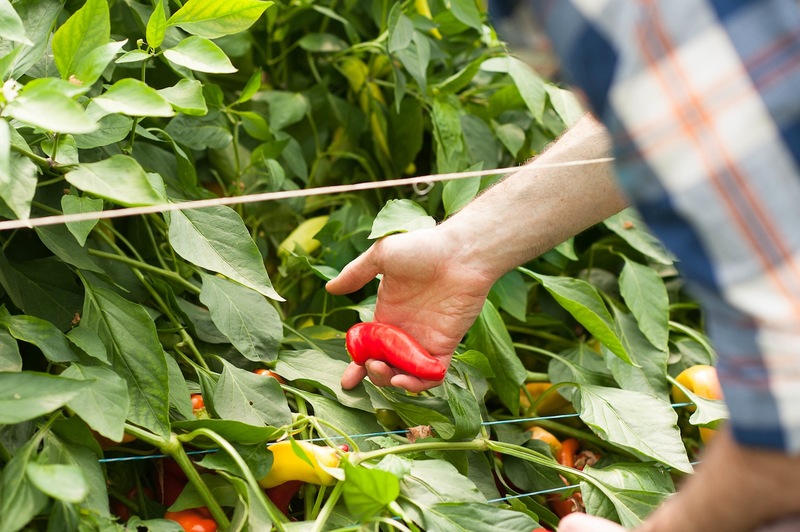 After combing the farm’s fields to locate and taste these hot Jimmys, Shaun didn’t discard the not-sweet sweet pepper or rip up all of the other plants in frustration. He liked how the sweet “Jimmy flavor“ would gradually build into something much hotter while chewing. “It’s that slow building heat that we’ve been trying to cultivate each year [since],” Shaun told me. Plants reproduce either by open pollination or within a highly controlled environment, via human intervention. An open pollinated vegetable, flower, or fruit pollinates itself either by cross-pollinating with other varieties that surround it – so a hot pepper cross pollinating with a sweet Jimmy Nardello – or has male and female parts and self-pollinates, no outside parties necessary or invited. Open pollinated seeds can be saved each year: farmers and gardeners select the seeds from the most favorable of plants and replant them the following year, and when unique traits are expressed, those seeds are often saved too, creating a resilient and unique collection of seeds from a single plant grown out several years in row. 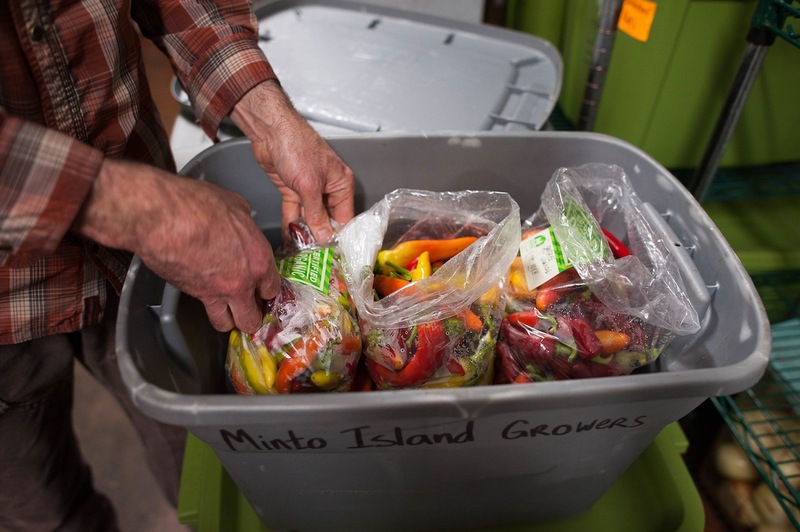 Peppers are predominantly self-pollinators, which is why a hot Jimmy Nardello was such a surprise to Erin, Shaun, and the Mountain Home customers. Once a plant is pollinated, no matter the manner, its resulting children exhibit characteristics of both parents – sometimes more father than mother (oh, how unfortunate, she has her fathers’ nose...), sometimes in ways that seem nothing like either parents (a lanky blonde from two short red headed parents). The Hot Winter’s parents were a Jimmy Nardello and a hot pepper from a neighboring plot. Intrigued by the flavor, Shaun and Erin began to save seeds from that pepper and grow it out each season, carefully monitoring its flavor, resiliency, and growing speed. They recognized the beauty in this different pepper and allowed the plant to flourish with careful selection and monitoring. After several years of iteratively growing and seed saving, Erin and Shaun faced a field of 100 individual plants, about to embark on an extreme taste challenge, not to be taken lightly. 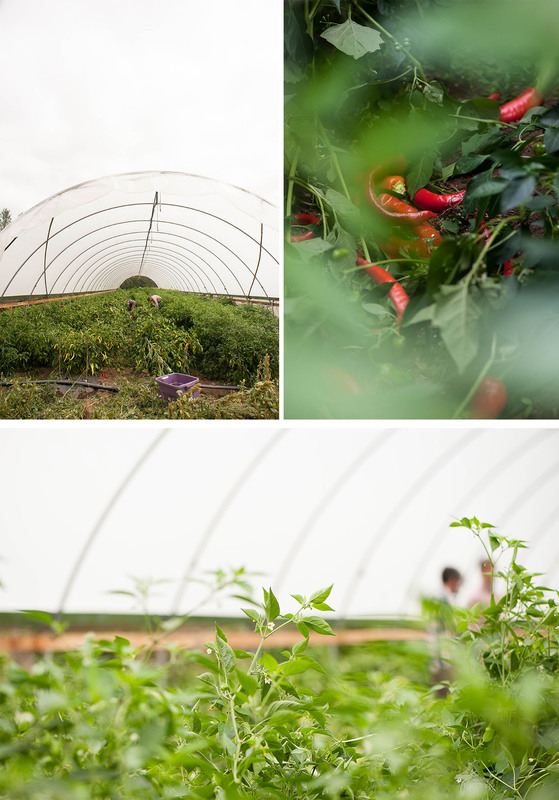 They went through the field and tasted each pepper, a process which Shaun reported started out “fun, and got silly, and then became kind of awful – a hazing.” Erin and Shaun were self-hazing in order to find the fifteen healthiest, most vigorous plants from those 100 plants. After deeming the plant stable (90-95% of the plants growing from seed were exhibiting the same characteristics), Shaun named this new pepper a “Hot Winter”. Shaun graced me with a basic genetics lesson, and I’ll do you the favor as well. “A genotype [encapsulates] all the coding that’s in an organism for how it wants to be in the world.” He continued, “a phenotype is a physical expression of that individual; you can have multiple phenotypes within genotypes.” A specific pepper grows differently in different environments, even if it’s genetically the same pepper. 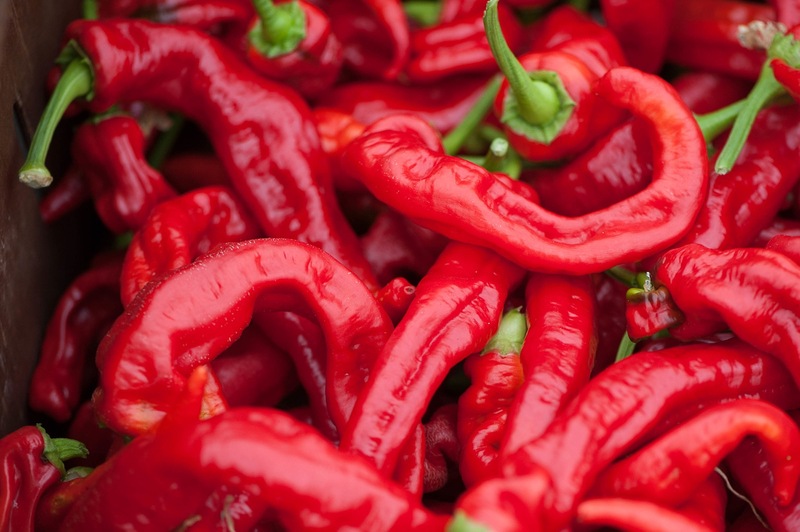 The hot winter pepper has two expression: one version of the pepper does better in cooler climates, resulting in a sweeter and bigger pepper, while the other prefers a hotter climate and yields a smaller but hotter pepper. 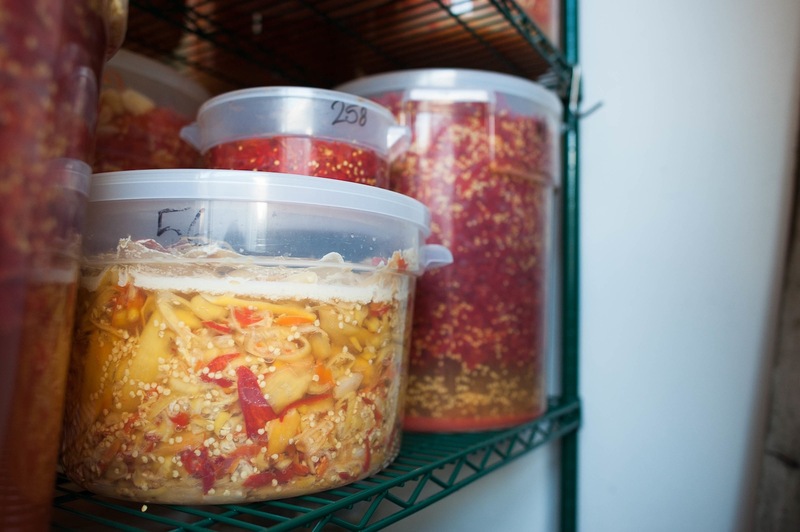 When Shaun begins to ferment the peppers, usually at the end of August, the first batches of the year aren’t as hot as the batches later in the year. Shaun diligently saved and planted the hot winter pepper for several years before he began to transform it, and some of its pepper brethren, into some of the best hot sauce I’ve ever tasted, a thick paste that initially tastes pleasingly savory, like a concentrated shakshuka or peppers just charred on the stove top burner, before the savory is edged out for a sweetness that evokes thinly sliced sweet peppers. Then you swallow. And that’s when the heat builds, barely perceptible at first, and then it stays, but in a way that makes you keep shaking the bottle onto your breakfast burrito. It‘s hot but your mouth is intrigued and wants more – almost like your taste buds have woken up and want to be as involved as your teeth and tongue. Will it stay this hot? Will the heat build? What will happen if I add just a little bit more? Shaun’s Hot Winter hot sauce makes me consider flavors in a way that hot sauces never have before: each bite leads to musings of pepper varieties, flavor combinations, and even the role a condiment like hot sauce can have in a meal. Before Hot Winter’s hot sauce, I considered hot sauce as just another condiment in the fridge, one that frequently burned my throat. 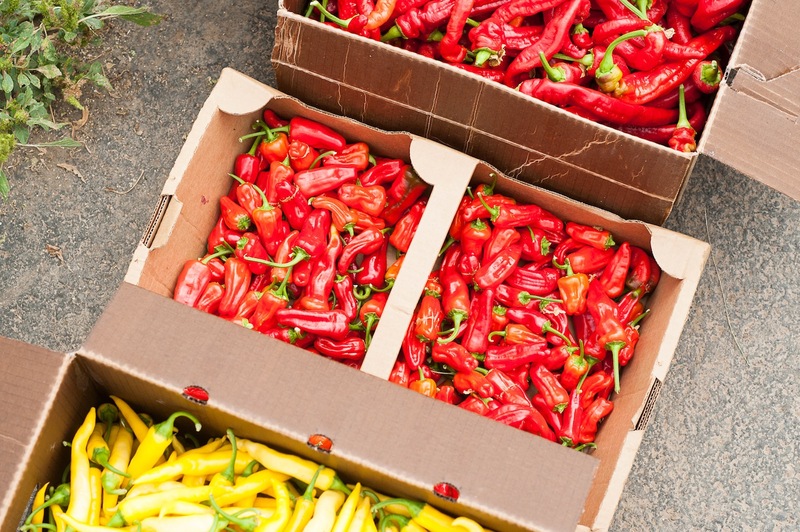 After Hot Winter’s hot sauce, the connection between land, farmer, seasonality, and the vast swath of pepper varieties is clearer than ever – and I’m reminded of it each time I open up a bottle and take a whiff. 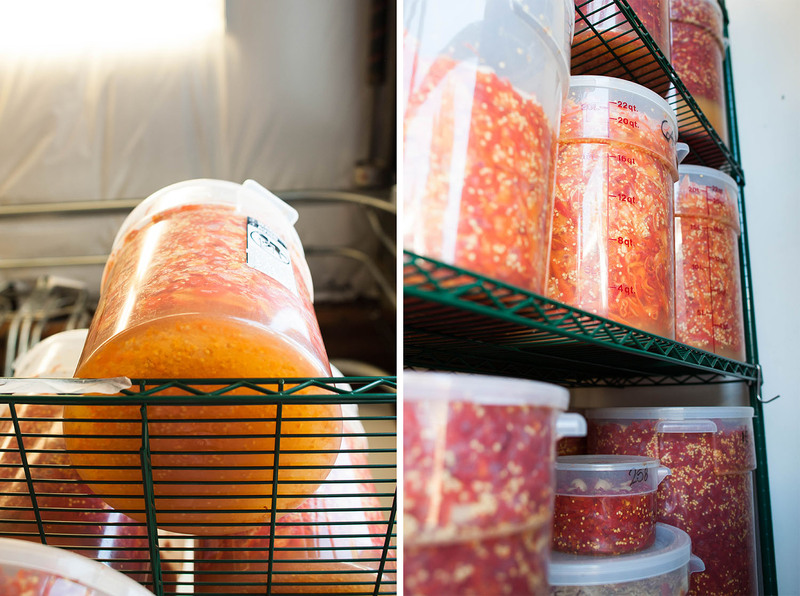 The key to the flavor (beyond the inputs of sun, soil, and human intervention) is, of course, the fermentation of the peppers. Shaun chops up the peppers, adds these chopped peppers to plastic ten gallon containers, sprinkles in salt, and waits. 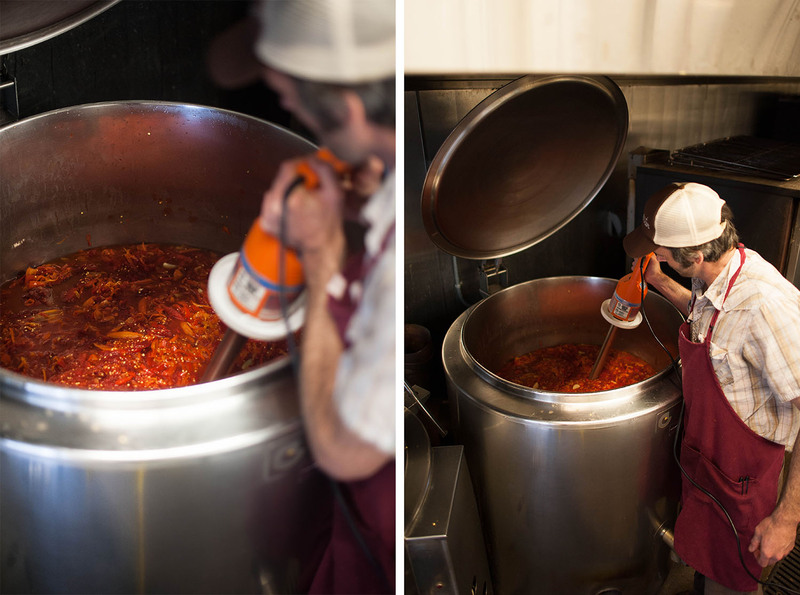 Eventually the salt is absorbed, the peppers break down, and the liquid rises, sometimes bubbling out of the container. The added salt pulls the moisture out of the peppers, and promotes the further growth of salt-tolerant Lactobacillus while suppressing the growth of other bacteria. 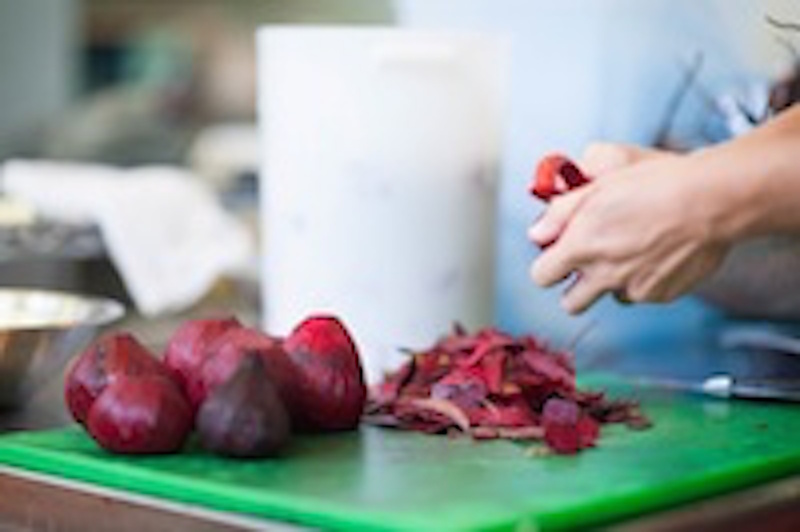 The quantity of salt added is personal preference, and though I wasn’t privy to how much salt Shaun adds, anyone making hot sauce – or any lacto-fermented vegetable – should be aware that over salting can stall or prevent fermentation. There’s a fine line between using salt to slow fermentation down and using salt to halt fermentation. There are over 180 species in the genus Lactobacillus. Some species, like Streptococcus and Leuconostoc, produce the least amount of acid. These are generally followed by a heterofermentative species of Lactobacillus producing moderate amounts of acid, and ultimately succeeded by the homofermenters of the Lactobacillus species, which produce enough acid that only they can survive, inhibiting the growth of bacteria that might spoil or decompose the food. Shaun doesn’t add starter cultures (adding cultures like L. plantarum, L. rhamnosus, and L. acidophilus are quite common) to stimulate flavor or influence the speed of fermentation, instead relying on the wild bacteria already present on the pepper, a spontaneous fermentation initiated by a heterofermentative lactic acid bacteria such as Leuconostoc Mesenteroides. 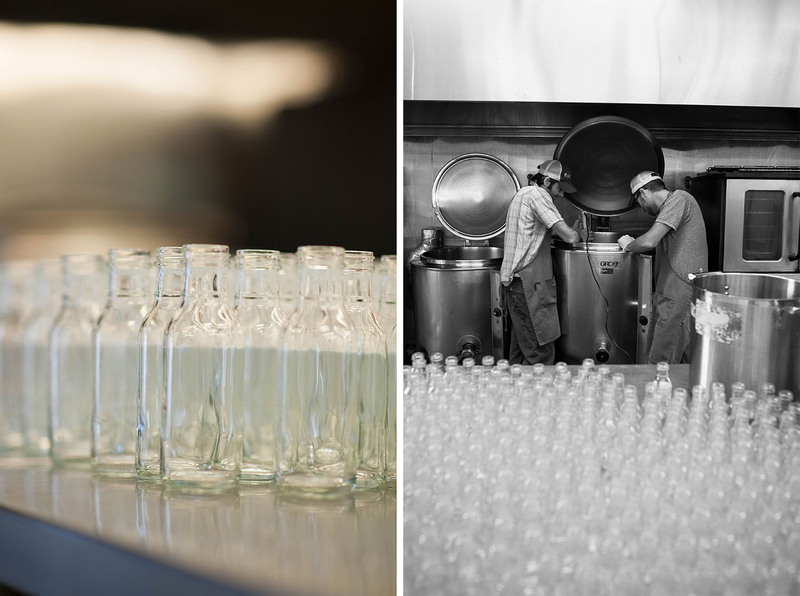 From there, the fermentation will switch gears to favor more acid tolerant strains of lactic acid bacteria like L. brevis or Pediococcus cerevisiae, before ultimately making way for L. Plantarum, as the pH continues to drop. 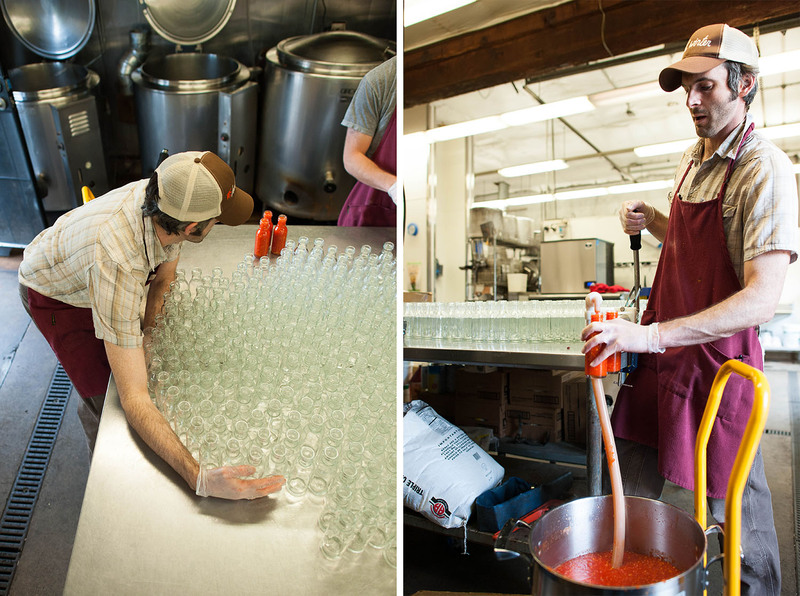 In his first year of hot sauce production, Mountain Home grew the majority of the peppers for the Hot Winter sauce, enough for 700 units of hot sauce that Shaun sold in five stores. 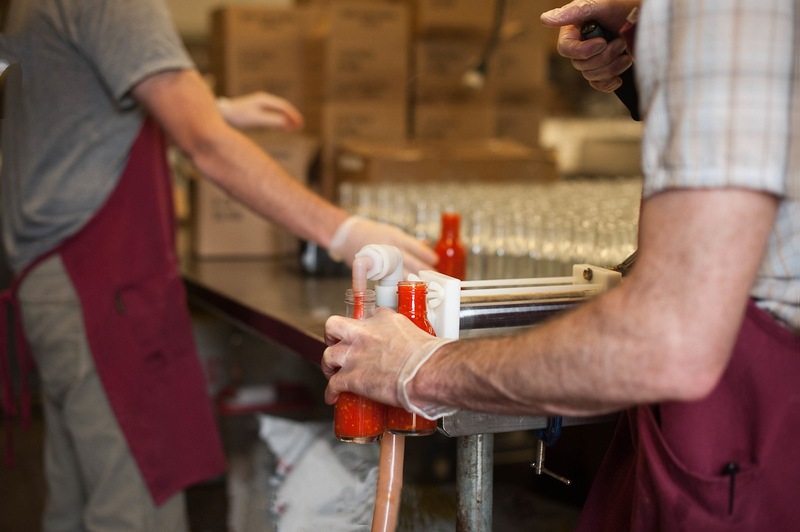 In mid-October of this year, his third full season, I watched him immersion blend a huge batch of sauce before pumping the brilliantly red hued liquidy paste into small bottles, sliding them over to his one employee, Mark, to be topped and boxed. In his three years of business, Shaun’s adapted along the way, not unlike how a pepper plant adapts to its environment, soil, and farmer. 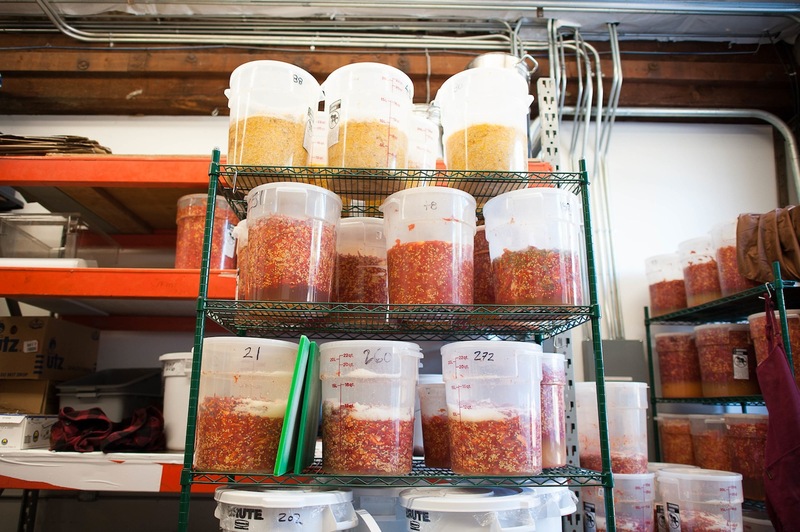 He bottled 11,000 units last year; this year he predicts he’ll ferment enough hot sauces for 16,000 units. You can find his bottles all over Portland (seriously: check nearly any grocery store), in Northern California (the birthplace of the hot winter pepper), and online, where he nurtures a vocally supportive fan-base all over the country, a fan-base that recently successfully funded Shaun’s Kiva campaign to help him purchase 3,570 more pounds of chiles that he’ll transform into 8100 more bottles of hot sauce. As Hot Winter has expanded, Shaun’s goal has rung true: Mountain Home no longer grows the majority of the peppers for his hot sauces. 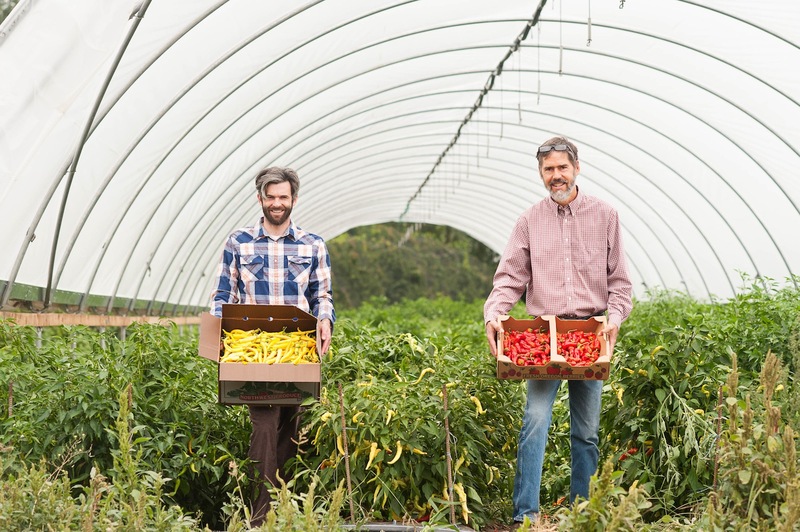 He’s chosen to foster local agricultural connections, finding environments in Oregon where the hot winter pepper can prosper, and where Hot Winter the business can also succeed. 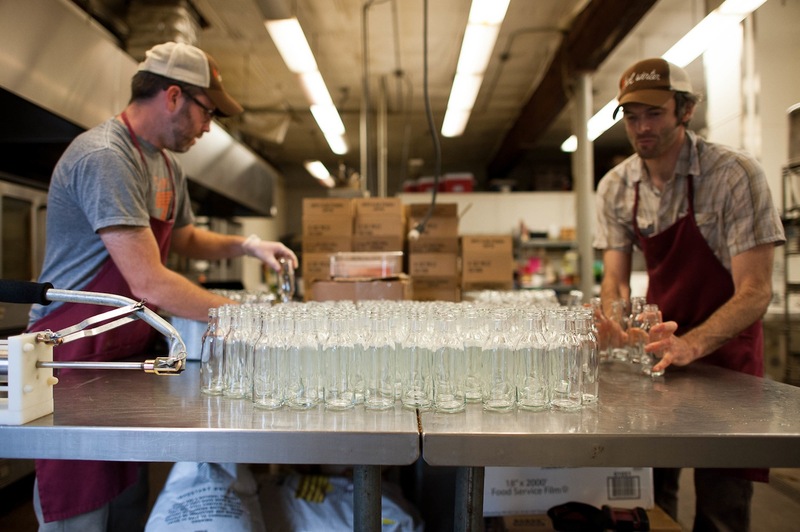 This year he’s partnered with Fiddlehead Farm in Corbett (run by farming couple Katie and Rowan, who also supply Shaun’s garlic), Denison Farm in Corvallis, Troutdale’s Dancing Roots Farm, Aurora’s Simington Gardens and Minto Island Growers, which grew half of Hot Winter’s poblanos. Shaun found his partner farms through word of mouth or the internet (“no farms without a website” was one of his stipulations) and tries to nurture relationships where the scale and specifics work for both parties. This is an aspect he continues to tweak: what is the ideal scale of farm to work with? Who benefits and for whom is this simply not worth the time? For whom could this partnership make a financial difference? As this growing season has passed and the fermentation liquids head into individual bottles, he’s drawn a few conclusions, but these are conclusions that won’t come to fruition until the next growing season – as a producer of a seasonal product, Shaun’s yearly schedule is quite seasonal too. The differences in the peppers coming from all the farms is fascinating. I saw peppers stored in the walk-in refrigerator, on an acre’s worth of plants at Denison Farm (where I stood and photographed in a greenhouse that smelled viscerally of hot peppers, the green plants distinguishable from each other only by the colorful, neon hued peppers dangling from them), and in various states of ferment in ten gallon tubs. Throughout this season, Shaun has unloaded and processed pepper varieties with noticeable differences: some of the same varieties grew bigger at one farm than another, others exhibited a richer hue in a different climate, some could be stored for four days before succumbing to early states of rot, others for as long as two weeks. All of these unique peppers will eventually find their way into his hot sauces, lending a terroir, and a story of the season and relationship. 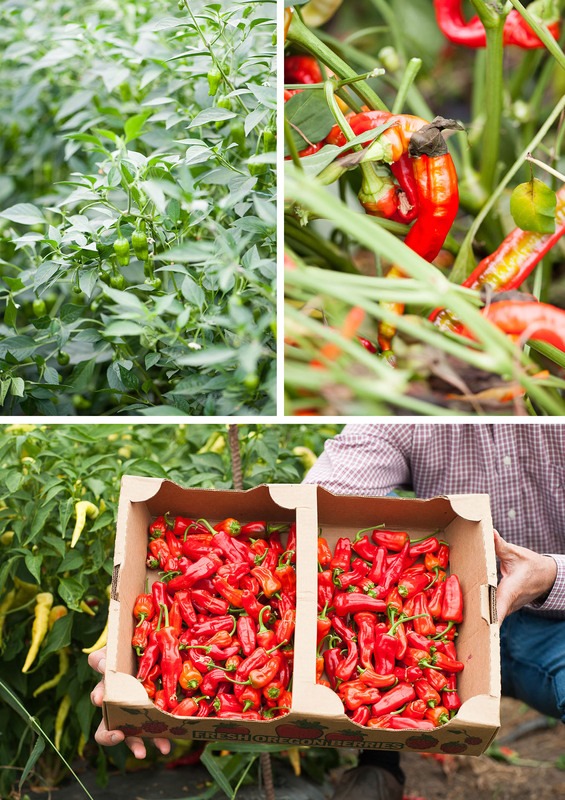 The uniqueness of the Hot Winter pepper was nurtured by the environment, farmers, and simply by paying attention. Like that first special Jimmy Nardello pepper, recessive traits exist in us as well: each of us might have an affinity that could lie dormant for years, or even wither and die, until another human, environment, or living situation coaxes it out. In a land race system (an agricultural system that saves and grows these rogue seeds), the plants are grown and the diversity celebrated. In a human’s case, one will only pursue this new aspect of himself if the environment encourages it. Shaun’s hot sauce is like the pretty purple bean that was allowed to flourish – or more appropriately the hot Jimmy that wasn’t discarded. 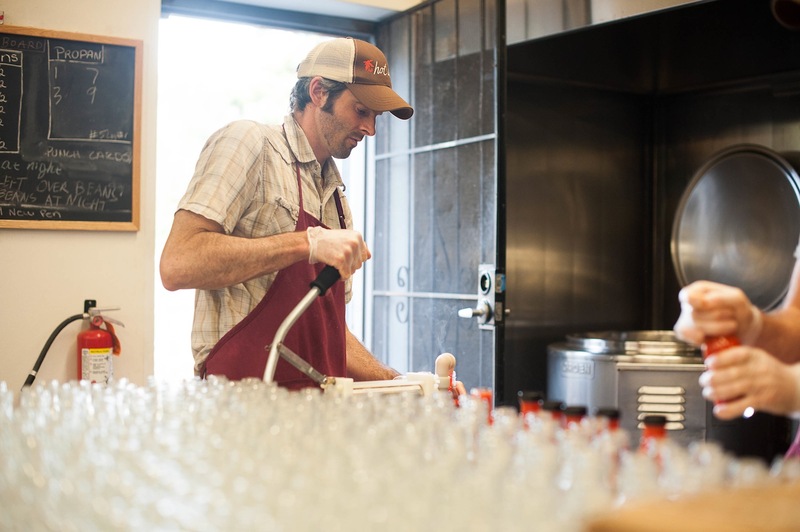 Throughout his career incarnations, Shaun was gathering skills that allowed him to recognize the specialness of that pepper, and concurrently, a way to create a genuine product that’s linked to a broader community. If a rogue tomato was pretty but inedible, it might be celebrated for its uniqueness but it wouldn’t be cultivated. If Shaun’s sauce was just a good story, but not rooted by deeply held beliefs, Hot Winter wouldn’t exist as a company. It’s a confluence of factors that make his hot sauce a compelling contribution to a diverse system. Instead of the consistency of an industrial product, the consumer, the farmer and the pepper all get something greater: inclusion in a flavorful story and taste that’s bound to its environment.